Multi-use Farm for sale: barn is new construction, state-of-the-art passive solar on south facing slope in temperate zone on 59 acres with 30 acre in timber, year-round spring, new well & driveway, and septic design & permit. 5 kilometers from year-round farmers market. Hasn't been farmed for over 8 years so perfect for organic certification. The province is putting their $ in to supporting local agriculture and good stewardship grants available. 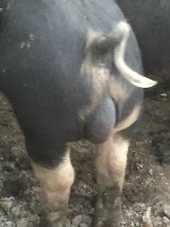 Unfortunately, I will not be able to move my AWA pig farm, https://www.facebook.com/Mason-Creek-Farm-125513010889959/ , to NS so am looking to sell. The barn is brand new construction, state-of-the-art passive solar on south facing slope in temperate zone on 59 acres just 5 kilometers from year-round farmers market. 200 ft from pavement with new well, septic permit and excellent views of Annapolis River and "pea round" which is one of the very first farmed areas in North America. The province of Nova Scotia is putting their $ in to supporting local agriculture, http://novascotia.ca/ , and grants are available to non-citizens. FYI: Canada gives expedited service to Farmers: I got my work permit in 2 months!. and the premier Stephen McNeil will be your neighbbor so help is available. Looks like the wire held. Remember that most worm lifecycles are 28 days so you want to try and rotate onto fresh before then to break the lifecycle. That is an Inguinial Hernia, most common in males and happens in 3-5%. It can cause death if it impacts but rare. DO NOT CASTRATE. Pigs can throw up so bloat is not a real issue. all my pigs (I have 19 sows, 3 boars & finish 200+ fats a year) are on single wire and all are rotated monthly on to fresh pasture. Its simple: get the biggest solar fencer you can get with a deep cycle battery ( or a 10-50 mile direct live fencer if you are so lucky to have electric) and have one unit per pasture block. You need to check the fence line regularly as they will root up to it and the line will short out on the ground ... and of course you have to feed them. Hunger is the rule of thumb for animals jumping a fence. I would say though, you should "train" your weanlings to an electric fence : at weaning keep them in a pen made with hog panels (and shelter of course) and run a line of electric across one small part of it for 3-5 days before turning out to run at large. The science says 3 weeks. Beyond any other livestock: pigs are what they eat! Aromatics and fats will affect flavor the most. Most pig forage crops are above ground as they tend to be fast growing and soft. In my environment & experience, Umbelliferae, are root of choice but Blackberrys are right up there. If you choose the right pig (Tamworth & Tamworth crosses are know as excellent rooters as they have a wonderful long & powerful nose) they will root regardless looking for grubs and other forage. Please count on giving them supplemental feed with a mineral ration, and then watch out for the associated salts and soil compaction. Nothing in life is free. So I raise and finish pigs in the ozarks and we had a bumper crop year for nuts & acorns. My hogs prefered the forage to feed but they wound up taking longer to finish out so it seems that they still needed the calories to make weight. The general rule of thumb is that you need 4 pounds of feed for every pound of gain and I don't think that the acorns & nuts have much poundage once you take out the weight of the shell. If is a high quality fat and will give the meat a great flavor and it is NOT too soft ... perfect for the fork. Anyway, once they finish the forage they'll be back to feed and "back on course" for the butcher. Regarding scraps, think of them as a vitamin to enrich the quality of their diet but the will need grain for the caloric part.